From the #DailyGRRR!, an interview with Lana, a blockader at the Dam Line 9 occupation in Innerkip. Lana talks about why blockaders are concerned about Line 9 as well as what is happening on site. August 8, 2014 -- This is an interview with Lana, a blockader at the Dam Line 9 occupation in Innerkip. Lana will talk about why blockaders are concerned about Line 9 and what is happening on site. 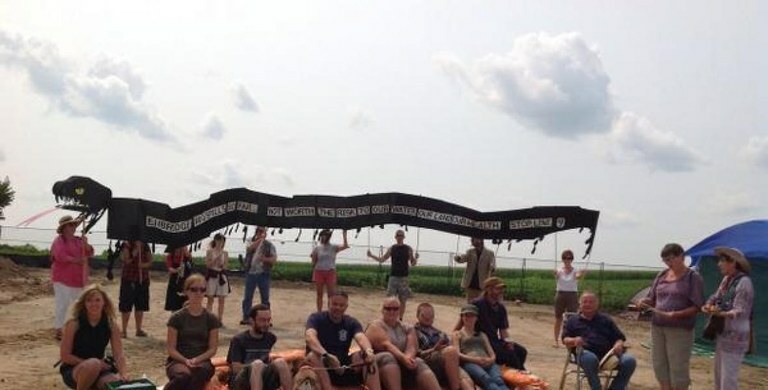 The occupation of a construction site on Line 9 site is continuing Friday, August 8. The site of a proposed valve installation has been occupied since 7 a.m. Tuesday morning. Blockaders are maintaining their commitment to defend the watershed of the Antler (Thames) river and all waterways and ecosystems that Line 9 crosses and that suffer from tar sands extraction. Line 9 is slated to carry tar sands bitumen and fracked bakken shale oil eastward from Sarnia to Montreal. The risks of these oils poses a grave threat to ecosystems and communities along the line's entire route. As blockaders prepare for the long haul, they have planteda. garden on site--which is part of what was a farmer's field prior to enbridge's construction. Supporters are encouraged to come to the site! Information and directions are posted to damline9.tumblr.com Stay tuned for more on this after headlines.